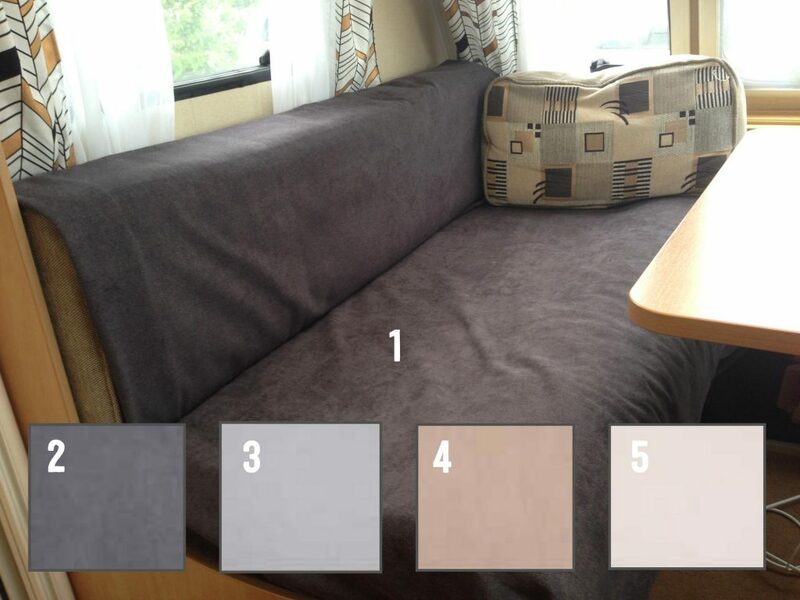 When I first bought my caravan, I felt the sofa fabric was the best I could get in a caravan in my budget. 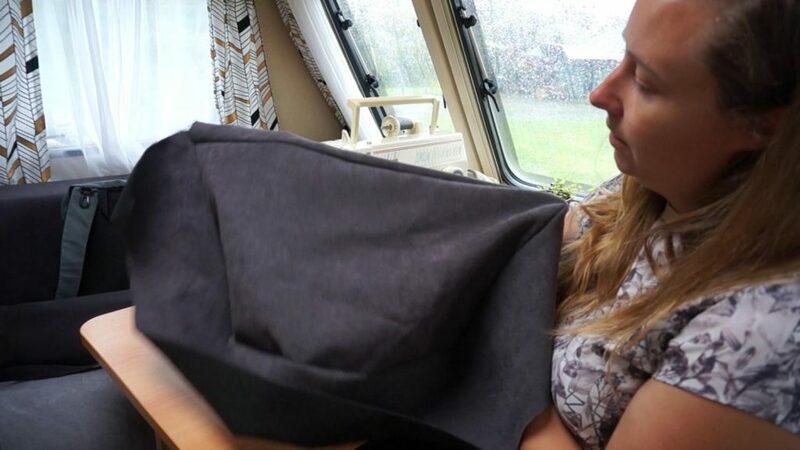 But after living in the caravan for a year and updating my curtains, the fabric no longer felt right. 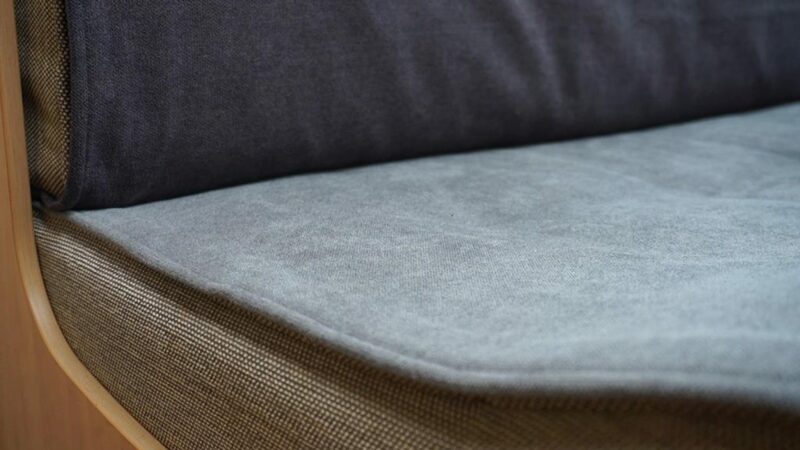 I decided to go a simple clean grey where I could swap the cushions to completely change the look of the space. My plan was to slowly buy batches of fabric when Spotlight had a sale. Start with the ends, the backs, then the bases. 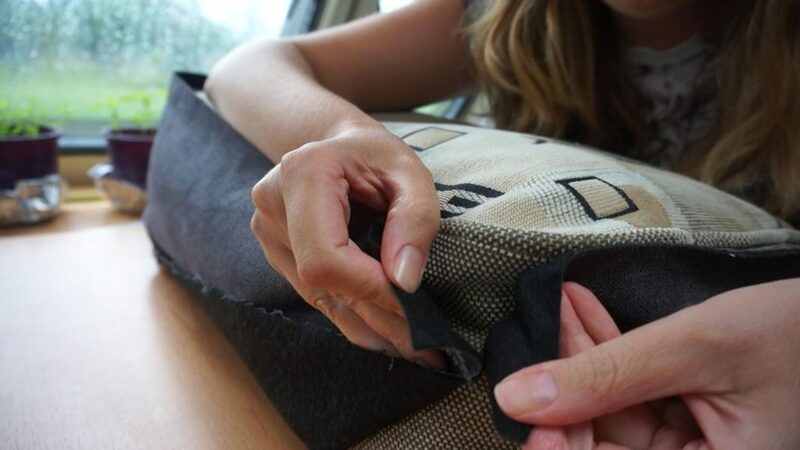 I found fabric called Carson Velvet Upholstery which felt so soft and came in lots of different shades and picked a charcoal colour. Another sale started at Spotlight, so I bought the backing fabric in charcoal. When I draped the fabric over all the sofas, I started to worry that it would be too dark at night. Because the caravan is such a small space, it seemed to darken the whole interior. Eventually I decided on a lighter shade of grey called graphite for the base material. And it works. It’s subtle enough that it looks like light playing over the sofa. I started with the backs and kept it very simple by making a tube. Extremely easy and changed the look of the space straight away. I then had a break and procrastinated some more. A couple of weeks later I sewed the bases and was vastly happy with the look. This is when I procrastinated for 2 months! The base and backs were doing the job, but I wasn’t finished. I had originally planned to add ends to the tubes, but decided it looked neater with just a sewn edge. Luckily the original fabric is bland enough that this works. 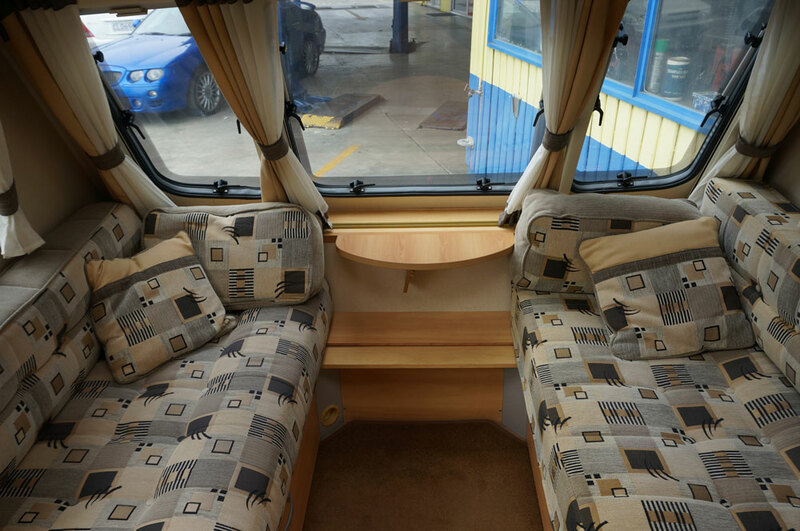 On a rainy day, I then tackled the more fiddly end cushions, when there was nothing else to do in the caravan. It was actually quite simple… why did it take me so long to do? The new casing is a rectangle with a long strip of fabric sewn all around. Then another rectangle is added to create a box, with a zip at one edge. I didn’t completely succeed with the first zip (it’s not as neat as I’d like), but had the knack by the second cushion. 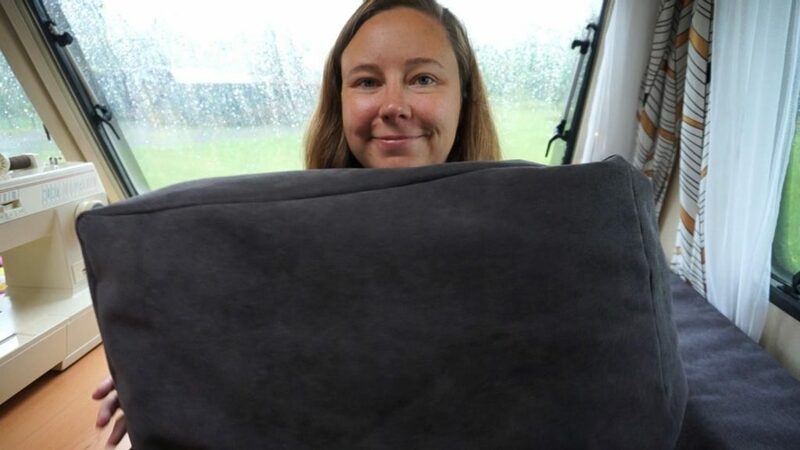 I was genuinely surprised to realise that the interior of the end cushions are just a pillow! 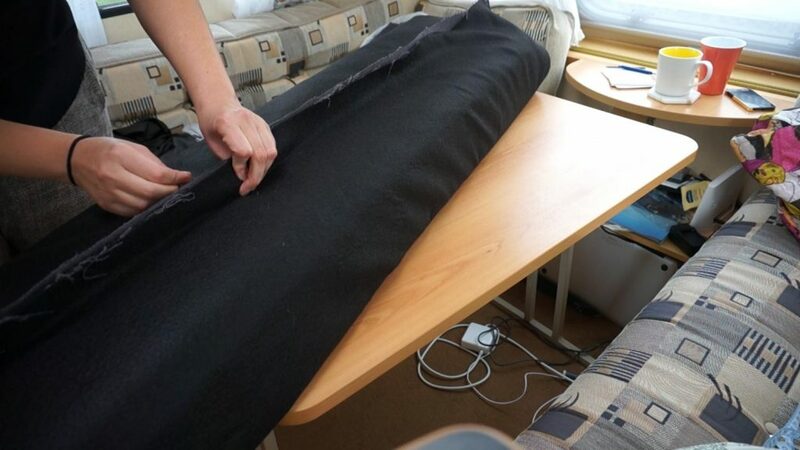 I had been unsure how sewing in the caravan would go. Would it race through my battery? Would I only be able to do small patches of sewing and then need to wait? But I learnt that the sewing machine was only 100W – tiny! A toaster is 850W. 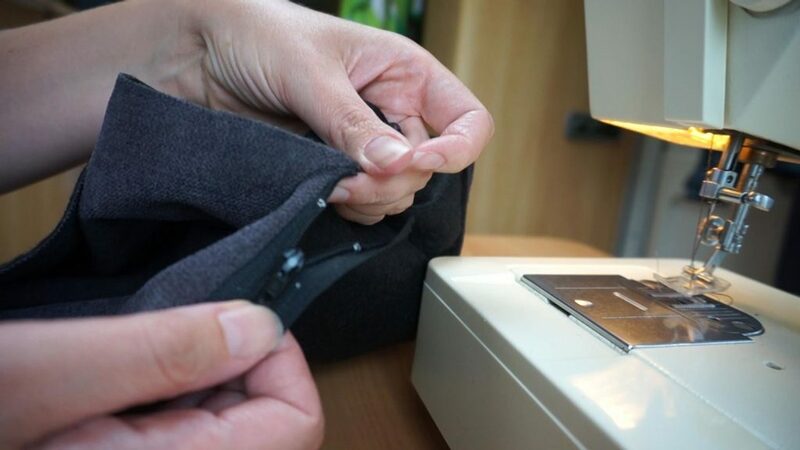 I never had to worry about the battery while sewing. I’m very happy with the finished sofa covers. These covers and the curtains really modernise the space. 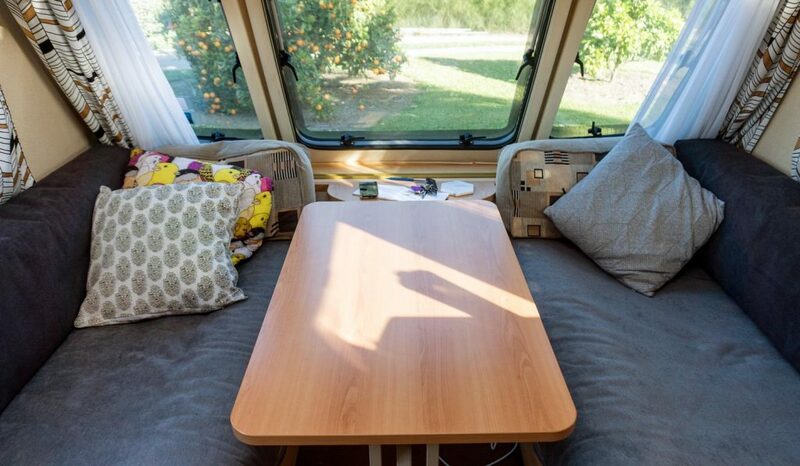 There is a real advantage to such a small space – any small alteration complete changes the look of the whole caravan. I’m planning to add some more colourful cushions soon. I’ve even started to design my own! What fabric would you have picked? 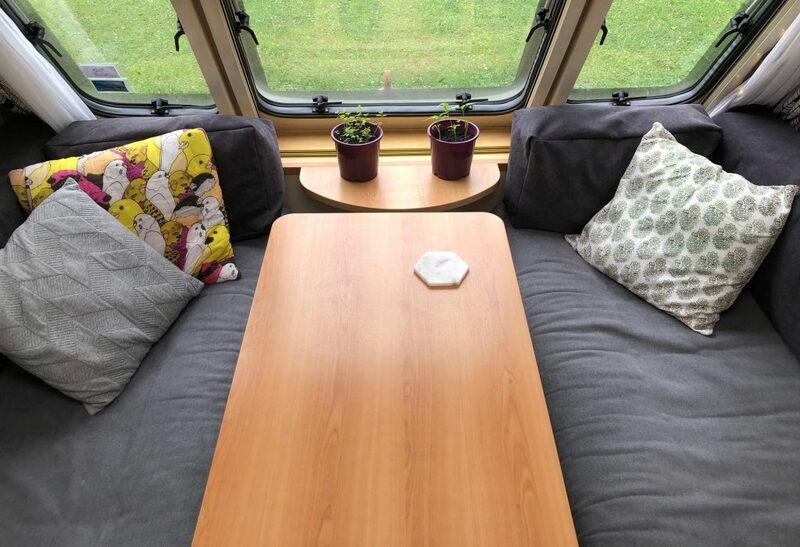 Do you have a favourite interior you’ve found online? I’d love to see it.